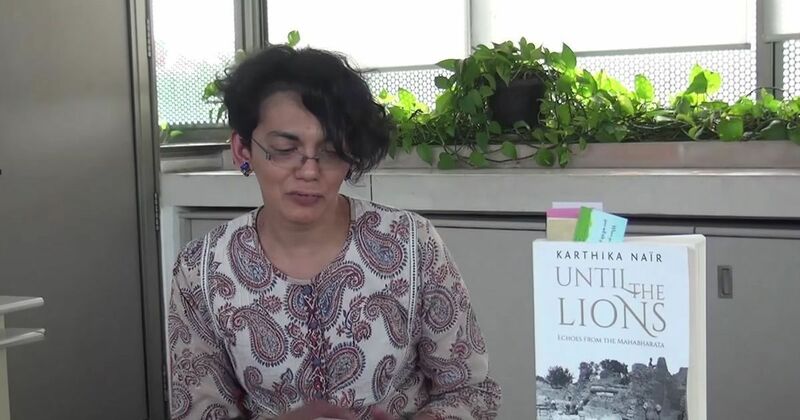 Karthika Naïr is India’s only poet to have won a fiction prize for a work of poetry. Karthika Naïr, one of the most complex poets of our times, enjoys an unusual marriage – that of poetry and dance. Born in India, she has been living in Paris for the past 17 years. And her two fluid worlds merge in her work as a dance producer, curator and poet. Naïr published her first book of poems, Bearings, in 2009. 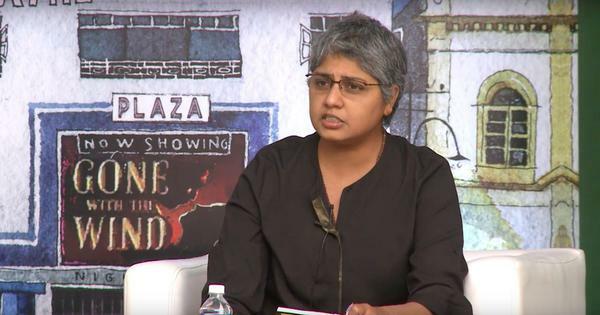 Her other works include Until the Lions, a poetic retelling of the Mahabharata in multiple voices, which won the 2015 Tata Literature Live Book of the Year Award for fiction, a rather unexpected award for poetry; The Honey Hunter, an illustrated book of children’s fiction; and DESH, choreographer Akram Khan’s award-winning dance production for which she wrote the script. What got you started with poetry? Poetry as practice, as expression: that happened entirely by accident. In urban India, we often graze more than one language every day. And as an “army brat”, I had been plunged into a very multilingual environment from infancy. After I moved to France, I found myself in a linguistically monolithic world, where one could go for days at a stretch without hearing another language. I craved the polyphony, the music, of languages jostling and chiming, moving around and through each other, and how that enriched thought. So poetry was my response to what I would call “linguistic solitude”. It was the only way I could converse with myself, maintain a mental logbook – there was a definite sense of cartography, whether kinetic or emotional, in writing poetry, which I think is fairly rampant all through Bearings, my first collection. These were also my early years of intense engagement with dance, and poetry gave me the most efficient tools to refract choreography. Who were the poets you grew up reading and loving? As a child and a teen, I had read a variety of poets, willy-nilly, without any deliberate purpose or exploration. I never “ did” literature after Class XII, so I had little awareness of the history of Western poetry, for instance. TS Eliot. I remember how Old Possum’s Book of Practical Cats and The Love Song of J Alfred Prufrock both came into my life at roughly the same time and the wonderment I felt at the capacity of poetry to do so much, to be blithe and earth-shattering at once. The Golden Gate, again, read when fifteen, was a revelation: the sonnet turned funambulist, ballet-dancer, landscapist, clown and philosopher. But much earlier, my love for poetry was through the lyrics of Hindi/Urdu songs of the 1950s and 60s, which my father was addicted to. Sahir Ludhianvi and Gulzar were very early gifts – and the advantage of discovering them so young was to be oblivious to the supposed divides of high and low art. From my mother, who, bless her, read Kunchan Nambiar aloud to me, I learnt of the delights of poetry as an oral art, foremost. But on a more personal level, what is poetry to you? A place of truth: not factual, descriptive or narrative truth, but truth of expression and emotion, pared to its essence. A forensic pathologist’s laboratory of sorts where unwieldy, difficult ideas, objects – pain, love, fear, hate, death, indifference, perhaps boredom – can be dissected, identified; their contours delineated. A place where the most inanimate or nightmarish of things can be given a voice, reshaped to human proportions and faced, to paraphrase Jeanette Winterson. All of which makes existence bearable and sharable, perhaps even jubilatory. If poetry were a creature, it would be pure bone and sinew and nerve, with no room for flab or cosmetics. Perhaps not even skin, at times. It wouldn’t always be pretty, but it would be true. Necessary. Actually, I think the words that apply best to poetry are from Salman Rushdie’s description of song in The Ground Beneath Her Feet: “an eff of the ineffable”. Yes, I think that is what poetry truly is. And why we need it. Wow! Coming to the writing process, how long does it usually take you to write a poem you’re satisfied with? There are no hard and fast rules. There are five-page poems that were written at one go, others where I could struggle over a couplet for days. I’ve been very fortunate in having a meticulous, engaged and ruthlessly critical circle of reader-friends whom I send my work to, and who give me extensive, attentive feedback, even when it is the tenth draft. Do you believe in inspiration? How much of your poetry do you “receive” from the universe? Inspiration is crucial. Poems have been triggered by the curve of a spine, by a heel striking the floor, by constellations cast by stage lights, by a voice rising in prayer or by reflections in a sleepy culvert in some nameless town. Just as they have by the words of another writer. What I receive from the universe is wild and varied. But inspiration is never enough. To be respectful of that inspiration, to be true to or worthy of it, one then has to add to or transform it, chisel and chip and polish, and make it into a complete being. At least, that’s how it has been for me. Inspiration also demands patience. There are thoughts or lines I have put away in a drawer for years, till they could be surrounded by other lines that deserved them. You will the sun and moon unhinged, you sever orbits with scarred hands. I will futures to a bonfire: words, kindled with music and memory. We will renounce hereafter: hold no wakes for dead constellations. As a poet, what are the main subjects and themes you are drawn to? Movement, always. Dance, in particular. But there has been a change across time: initially, I was most interested in dance as a narrative springboard for poetry. So in Bearings, most of the ekphrastic poems contained another narrative; I had spun further – or separate – stories from the existing dance piece. But in the last few years, I have been more interested in the ossature of dance, in compositional structures and how they can be replicated (or remodelled) in poetry. Memory, and the intersection of memories. You never revisit an incident in quite the same way and when many people remember the same moment, it generates an unexpected outcrop of memories. And that tensile, often problematic, relationship between memory and truth. Place, but I speak of that a little further! And the body, its resilience, its betrayals, its friability. The body as location, as space. As a marker of identity. Let’s examine some of these closely. What is the meeting point of dance and poetry in your world, for instance? For a very long time, poetry – as practice – happened only in the interstices of dance, which can be a juggernaut: magnificent but demanding and all-consuming. I wrote in airports and on trains, in hospital waiting rooms or in post-op, after long evenings of rehearsal or while waiting for the crew to load out. Then, in mid-2014, my ever-volatile health spiralled downwards with a vengeance and I had to stop working for a year. In retrospect, this may have been the best thing to happen because I had to envisage another equation with dance than the high-octane producer-ly existence and that allowed poetry, and writing in general, to occupy centre-stage for eighteen months. And how does a place affect you and your work? I never wrote poetry as an adult while in India. There were just some execrable verses written between ages 9 and 12, which I had the good sense to burn in a fireplace at 13. I consciously began writing poetry only in 2006, many years after moving to Paris. Place has a very strong influence, but not in stylistic terms. Place is a moment, it is time; and I am obsessed with mapping the place-time loci (the Far from Chagall triolets, for instance, attempt precisely that) inside human memory. not meltdown of that myth: Together. that dies: minds in flight can seel thought. the pain, staunch the blame... feign consent. for the ground sunshine, for these hues. Then you’ll move into yesterday. The sky runs copper, stains trees blue. to bathe the pines, restore life’s sheen. relief and grief. No wraiths alight. for the songless have lambent night. Going beyond writing poetry, since you’ve done quite a bit of translation, what’s that process like? The difference between writing and translating, to me, is like the difference between choreographing and dancing (to someone else’s composition). On the one hand, you are free of the onus of original creation but on the other, you must perform it or transform it, as faithfully to the creator as possible. So while the work is being rendered through another body (or another tongue, in the case of translation), it must evoke the same emotion, conjure up the same world, that the original intended. That’s what draws me to translation: the eagerness to bring that existing beauty and thought to another world with as much precision, attention and humility as possible. With the knowledge that it will never be quite the same, that some things will be lost; but with the hope that some things may also be found. You’ve also been involved in collaborations like The Honey Hunter, a gorgeous children’s book where you wrote the story and French illustrator Joëlle Jolivet did the visuals. Any more collaborative work on the cards? The Honey Hunter was one of the happiest adventures ever, and Joëlle and I would like to work together again. I’ve also been collaborating with another poet for some months now, and that’s been quite an extraordinary, invigorating experience. Besides, all my dance writing is highly collaborative: to begin with, the writer knows that most of the text must be transmuted into other components (sets and music, movement and lighting, sometimes – as with DESH – animation). Until the Lions has now been commissioned for an opera adaptation; I look forward to this because it will be a totally different experience. I am curious to see how a composer working with voices will want to mould the book into a libretto. But what do you look for in a collaborator? Collaborations are often instinctive. With Joëlle, for instance, I saw her animals and knew instantly that she would bring the phantasmagoric, often overtly visual, world of The Honey Hunter to life. After a year of looking for the right person, it took merely five seconds for realisation to strike. Of course, I was inordinately fortunate that she loved the story, the words; that she should want to bring it to life. That’s how it became a collaboration, and didn’t just stay a dream, thankfully. Last question: what do you see as the role of poet in modern-day society? That of any citizen. With the added awareness, perhaps, of what one could do with one’s voice if it is heard. And while I consider all art-making as a political act, I do believe there should be no “shoulds”: far too much has become prescriptive in today’s world, and the first obligation of the imagination is to be true to itself. A fellow poet’s desire to write about the changing colours of dusk is as valid as another’s decision to remind us of mankind’s increasing exploitation of the planet; the urgency varies for us as readers, but the writer’s impetus should be her/his prerogative. where you might not be to bookend this being.